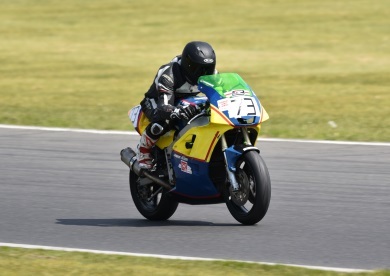 Last weekend I was at Snetterton. I went up without the wife, first weekend shes not been there, and entered the Friday test day. The SV was working beautifully, I had cured the overheating problem and the changes I had made, made the bike feel a lot more capable. During testing and whilst I was just getting used to the circuit I haven't raced on since 2015 I posted a 2:15 lap time which is 6 seconds faster than my fastest time on the Minitwin in 2015! Unfortunately the bike gave up on me in the second afternoon session. Not sure exactly what has happened yet but it sounds like a couple of valves have been just caught by the pistons. A full examination will commence shortly. After thinking this was the end of my weekend a friend offered me his spare bike to race. This meant I could carry on racing in the same class I would of raced the SV in although this was I believe the smallest capacity bike on the grid! So I took this bike a Kawasaki ZXR400 with 59hp :D out for the last test session on Friday and stiffened up the very soft suspension and put a bigger rear sprocket in ready for qualifying on Saturday morning. My first timed lap on the 400 was a 2:25.9 which placed me 33rd on the grid, 24th in my class. It was a little disappointing that a 2:15 lap or better on the SV would of placed me around 15th or above. Race 1 was interesting as this was only the fourth time I've ever ridden a 400 and the first time I've raced one. The bike was faultless and apart from getting the gears wrong in a lot of corners and letting the bike bog down it was all good. I finished 32nd, 24th in my class with a fastest time of 2:23.1. Race 2 was good fun apart from completely bogging down off the start. I was convinced I was going to get taken out but fortunately all the rookies avoided me. I started this race from the 30th grid slot and had a good run on the 400. My time improved to a 2:21.0 and I finished in 22nd. The weather again was scorching on Sunday morning for race 3. I let a couple of PSI out of the rear as it was moving a lot on Saturday and we lined up for the third race of the weekend. I got a brilliant start and managed to make up about 5 places and then the gear shift rod fell off at Agostini's. I rode back to the pits in second gear and was met in the garage by Jamie Nagy, James 'Nuggie' Nagy and Connor Moody who sorted the bike for me and sent me back out. I had my gloves off and was resigned to a DNF. Massive thanks to those guys. I was "Not Classified" in the result but posted a time (2:21.0) that placed me mid pack (26th) for the next race. Race 4 was epic. A disqualified rider from the previous race started from the rear and in the first corner shoved a load of riders wide which helped me as I hit the apex and got my head down. After the first lap I was up to 16th and managed to finish the race in 17th which was 13th in class and a couple of points. Fastest lap was a 2:19.1. All in all the weekend started with a failure and ended with some points. Along the way a lot of hard racing and loads of laughs.